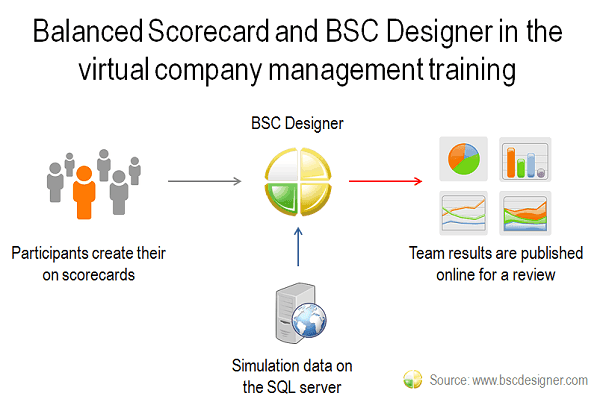 Among users of BSC Designer we have many teachers that need to explain business performance concepts to their students. On this page educational professionals and business consultants share their experience about teaching the Balanced Scorecard, and KPIs concepts. Learn more about their recommendations. Do you have a question? Feel free to ask and share your thoughts in the comments. BSC Designer is used internally for ISO 9001 2008 improvement control and quality. Also, training in BSC applications is held at the San Pedro Sula University Management School. Teaching BSC concepts with your products has been very easy since you have been able to present a product that can be used at various levels of complexity. Thank you for your opinion. BSC Designer is recognized by many professional business performance consultants. According to the geography of our users it is applied world-wide; not only in the US, but also in Europe, Africa, Middle East. I agree that this wouldn’t be possible without proper localization of the software not only to the main European languages, but also to Arabic and Chinese. As for support, we are happy to help our clients with the software and the basic business consulting needed to choose the best approach for their business performance management. We provide valuable information in articles featured on our website; and for sure we will answer questions via a contact form. We know how frustrating it is to receive poor technical support, such as when a template response is used or a person that you are talking to has only a set of limited scripts and have no idea about the product. Our technical support operates by email and answers all the questions in a professional manner within a maximum 48 hours (normally within just few hours). Test us, send us a question. Finally, I like your knowledge about various levels of complexity. I believe that each business solution should be chosen according to requirements of a specific customer. If one needs to feed data from Excel and present it on the dashboard and strategy map, why should he or she buy into an expensive ERP system that does everything, but not what’s needed. In this sense BSC Designer is really powerful, but one doesn’t need to use all of the features at once. Some people focus on KPIs management and others only use software to track their progress and monitor a performance. The good news is that once a user understands that he or she needs a strategy map, then there is no need to search for another tool. One can just go to a strategy map tab and that’s it. I teach computer security and information assurance at a community college. As part of our program, I engage our students in free consulting projects with non-profit organizations, usually local governments in the area, with the objective of having the students conduct risk assessments and develop continuity/recovery plans. A major issue in preparing and presenting plans is clarifying the linkage between plans and action – answering the ‘what do we need to do to get this done’ question. The BSC Designer tool is designed so that my students can quickly grasp the concepts of the BSC process, develop quantifiable indicators for their chosen perspectives. Going forward, our plan is to use the Professional version to develop strategy maps that will allow us to give our clients a roadmap on how to implement the recommendations, thereby increasing the value of the experience to both students and the local government. I chose BSC Designer because of its ease of use, clear graphical interface, excellent customer support, and not least, its cost. Thank you for the detailed feedback! The topic of the linkage between plans (business objectives) and action was improved significantly in the latest version. Objectives there can be linked by a cause-and-effect connection, which allows not just putting them on the map, but by linking them together. Following this one can answer a “why” question specific for any KPI or an objective. As for risk assessments with BSC, I must say that it is a tricky topic. Historically there are two group of people, one that prefer to address business performance from the viewpoint of risks, and another that follow business frameworks similar to BSC. If we can look in this, then it is obvious that everything depends on specific implementation. Risk indicators can be easily converted into BSC KPIs as well as any business objective can be represented as a Key Risk Indicators. Following requests from users we have even implemented Risk Diagram in BSC Designer. I am glad to see that you teach your students how they can use the Balanced Scorecard approach to address risk assessment problems. I suggested using BSC Designer software in a government organization for measuring and reporting of KPIs and the Balanced Scorecard. I think BSC Designer Light edition that I’ve tried is a very simple tool. It allows starting with KPI management, but the number of functions in a free edition is limited. Highly desirable that this version would allow the issuance of a report and a graph. Even if they were simple, it would allow generating information for distribution to others. I suggest evaluating the software for use in our government institution. They might choose the Standard or Professional version. I am also involved in the academic area, the BSC Designer Light edition with more functions would be very useful. Alberto, thank you a lot for your feedback. We are willing to help professionals in academic area to teach scorecard and KPIs concepts. That’s why the light version exists. It has all functionality to build a basic scorecard and to show how it will interconnect with KPIs. This version is great to create a prototype. If an educational organization or a company decide to use advanced features of the product then it makes sense to choose a Standard or PRO editions. As any professional tool BSC Designer requires a certain budget to purchase a license, but these investments will be returned in a form of increased efficiency of the business very quickly. The good news is that once a project was started in BSC Designer Light a company can continue using created projects in BSC Designer Standard, PRO, Online or Android. All these editions use the same .BSC file format. With the PRO edition there are many more ways to share information. Reports that you mentioned are only the basic mean. There are also dashboards and strategy maps that can be exported and shared as well. Moreover, if a project was uploaded to BSC Designer Online it is much easier to share the project. Actually, the pricing and functionality of BSC Designer Online might be more interesting for a teachers. There is no need to buy an expensive license at once. One can sign up with an account and pay as long as the system is used. For example, it is possible to pay for the usage of the system only during semester when the Balanced Scorecard or KPIs course is taught to students. Features set, friendliness, ease of use as well as accuracy, data migration and reporting represented in a consistent, accurate and understandable manner. BSC Designer is an excellent program that serves as a brilliant introduction to the electronic BSC environment. To download and test drive this piece of software would without a doubt be in the interest of the end-user. BSC Designer also addresses most of the questions novices might have about BSC setup and operational intricacies. This program is very easy to use and both novices and expert users alike will almost immediately feel at home using this program. Dr Moses, I thank you very much for the feedback. As a developer of BSC Designer we know that there are professionals from various business niches that use our software everyday; our objective is to make the software easy to use, and to provide all of the necessary features that one might need for the Balanced Scorecard. Also, I believe that the software part of any Balanced Scorecard software is relatively simple; as there are no rocket science equations. What’s making the difference is a business approach that should be incorporated into the software, so that it can help professionals to measure and manage business performance with the Balanced Scorecard. Another point is that the best software without a good example won’t really be useful. It is really hard to find an example of the Balanced Scorecard. We want to change this situation and publish some examples of BSC projects online. For example, for Healthcare we have a Dental Practice BSC that any medical practice can take, and then customize according to its needs and start using it right away. Still, we do understand that it is business software with a lot of features and users need to understand things intuitively and quickly. For this purpose there are video manuals for BSC Designer that help and answer a lot of typical questions. Finally, if users have a problem and don’t know how to solve it, we are always happy to help in our support center, just fill in a contact form and we will respond very quickly. We use BSC Designer for education and promotion of the Balanced Scorecard approach within strategical, organizational and basic IT needs. I personally think that BSC Designer is a good product, mostly to learn and propose to potential clients the approach of the Balanced Scorecard. Within this framework clients and managers may have a visual understanding of performance management; the free version is very good for demo and proposal, the paid version allow more in terms of deployment of performance management systems, therefore in an IT perspective. These tools do not require IT expertise but provides a correct methodological approach, can help to move from approach to implementation of NORTON/KAPLAN ideas. As a matter of fact the most difficult aspect of BSC approach is to help customers to properly translate their intuition into a strategical plan that eventually will become an operative plan with KPI and hopefully a BSC. Thank you for your detailed feedback. While the Balanced Scorecard is a really powerful approach, there is always some need for additional education about how to use the framework in business. With BSC Designer we are trying to make the design and usage of the Balanced Scorecard even easier. Some customers have even reported that learning from BSC Designer is better than from costly training. 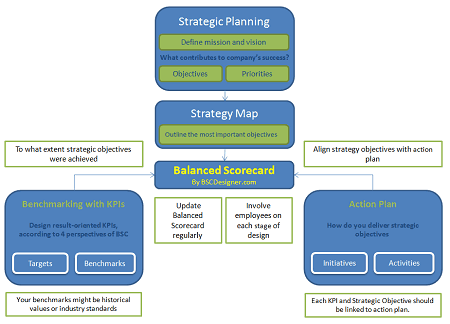 When we are talking about the Balanced Scorecard, the first thing that is obvious is that BSC gives you more than just talking about KPIs. As you noted, the business performance management starts with a strategic plan, not with KPIs. We are supporting this approach in BSC Designer. In the software one can start with business objectives, define their cause-and-effect connection and BSC Designer will build a strategic map according to BSC rules automatically. Only by having this big picture can a manager properly translate their ideas into an actionable plan, which can then be aligned with KPIs and business objectives. As for installation and maintenance, you are right. BSC Designer doesn’t require databases or complicated installation. It can be used equally well by one self-employed professional or by an international company. Working with BSC projects is as easy as working with MS Excel or MS Word documents. We have been asked to show our performance on the BSC. We have our strategic plan and I used your BSC Designer to review our performance at our end first. Our university has a different BSC software, but I used BSC Designer at the departmental level. Initially, it was not very clear. I tried putting in our initiatives and their KPIs, but could not interpret the results myself. Later, I used a few solved examples and learned a few things. By that time, the trial period had expired. I think the initial results produced were quite appealing to my seniors as they had not seen the results of any BSC software earlier. This presentation produced from BSC Designer made people believe that I was an expert in BSC which is a good sign for my future. It has also increased my interest in using software for BSC. My thanks to the developers. It was great to hear that BSC Designer helped present your strategic objectives and prepare a presentation that you used to impress your superiors. I’m sure you tried PowerPoint report for this purpose. 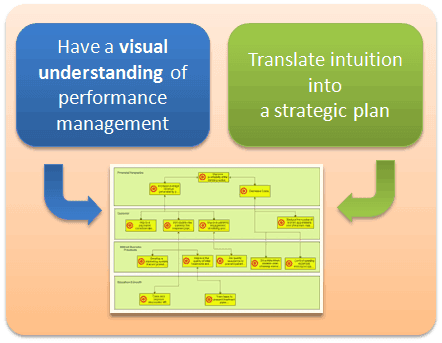 Another way to present performance ideas is to share a strategy map, which gives a lot of top-view information. 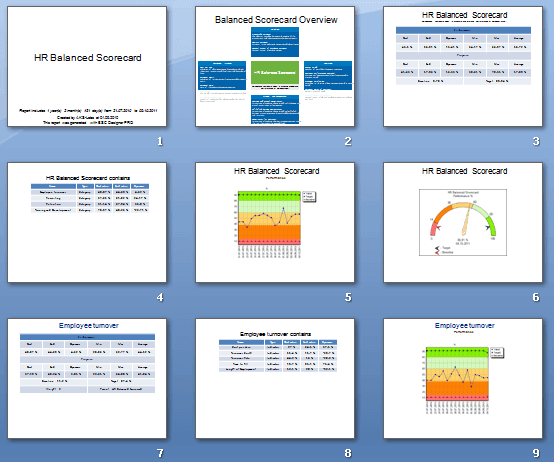 Actually, in the latest versions of BSC Designer we have updated PowerPoint report a little bit. One of the updates features is that a strategy map now comes among the first slides so you could start your Balanced Scorecard presentation from sharing the big picture of what’s happening. The presentation that BSC Designer generates is not a one size fits all solution. You should customize it according to your needs. Add in some relevant comments or graphics. You can prepare another reports, take a screenshot and paste it as an image into the presentation. Right now we are preparing an update, which will add even more features to a PowerPoint report. We plan to put in a PowerPoint report comments that user enters via “Initiatives.” If you have any ideas that can help you to prepare even better Balanced Scorecard presentation, please contact us, we are open for new ideas. This product is particularly effective for modeling and managing of a portfolio and projects. It demonstrates the successful way of management strategy implementation. The analytic method for evaluating projects is the objective evidence of successful management of expectations at all levels of a business organization. I hope to present my students a successful product for their future work as project leaders and managers in the IT business. In turn, they can develop their relation to the modeling and evaluation of the business environment. Thank you for your opinion. I find your approach to the business modeling very interesting. There are many tools on the market for process-level modeling. BSC Designer supports the operation level with KPIs, but what’s more interesting is the strategy map functionality that you have mentioned. 2. Why it is happening. It is easy to track the reason and the consequence as business objectives are not just listed on the strategy map, but linked with case-and-effect connections. 3. What the company is doing about this, as all KPIs and business objectives should be aligned with an action plan. For example, when a KPI “Average time spent on website” is decreasing and getting into the red zone (“what” part). A project leader can see how this KPI is related to other business objectives and draw a conclusion that the KPI is in danger because the website content is not as good as it supposed to be (why part). Then he or she can plan a business response to this problem or correct the current action plan (action part). In this situation a lot depends on a manager and how he will react according to the situation. In this case BSC Designer plays a role of an automation tool that help a manager see not only operational picture presented on the dashboard, but a strategic picture where business objectives are aligned with each other, KPIs and action. My task is the implementation of the Balanced Scorecard. One can use BSC Designer to create his own BSC models. Wilfredo Briceńo, Director Consultor de Wbric-Rpérez, C.A. BSC Designer is an easy to use tool, that gives visually accurate information. You can create and browse your models of BSC without any complications and facilitates the use of key indicators. I think that is also very intuitive when data is needed to be exported or imported. Hello Wilfredo! Thank you for sharing your feedback about BSC Designer. You are right; the Balanced Scorecard models created in BSC Designer are something that can be really useful for any top manager. And we are trying to help our customers by giving them some templates that they can use in their BSC projects. 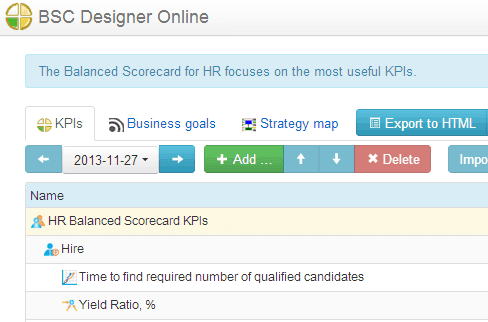 For example, we have an HR balanced scorecard that anyone can take and customize according to his needs. You mentioned KPIs, yes, BSC Designer gives all the means to manage these measures. I believe what is more important is that BSC Designer allows one to manage business objectives as well. 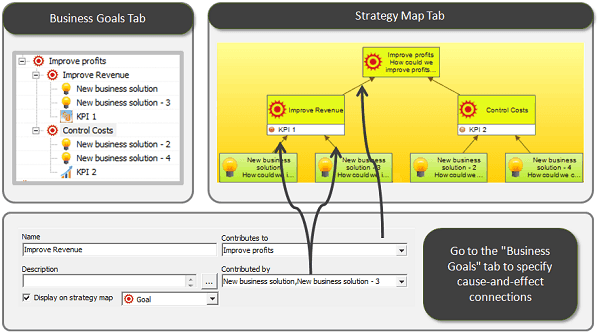 Organize them on the strategy map and align KPIs with specific business objectives. This is a great way to present a big picture of your business. As for data import/export, we are trying to do our best. Our research shows that most business people have their data in Excel spreadsheets, so in both editions of BSC Designer (online and desktop) you can easily export the data from Excel file into the program. Have a look at this page, it is for BSC Designer Online and shows all of the possible ways to import data. We are inviting business professionals to join the discussion about Balanced Scorecard and business performance models that one can create using this framework. How did you apply the Balanced Scorecard? Have you used generic strategies? How you did an alignment with KPIs and initiatives? Feel free to share in the comments. I am working on software and hardware application development and tried BSC Designer for checking out special scenarios for project development and controlling. After checking the BSC Designer Light version, I downloaded the BSC Designer PRO trial-version because of its additional features. The graphical interface improves the interactive modeling of business processes. Especially the possibility to manipulate values and to see the results immediately makes BSC Designer a “creative” tool. The software has an excellent functionality for developing strategies, modeling the underlying processes and checking out the consequences of changes under specific conditions. Applying BSC Designer to project data with known results allows a realistic estimation of the relationships between conditions given for processes in the past and achieved results. Based on such “success patterns” BSC Designer improves the modeling of expected results for future strategies depending on given conditions. BSC Designer is an easy-to-use tool for planning and prototyping business strategies under respect of context dependent influences. Different scenarios can easily be prototyped by using BSC Designer’s category-indicator structure and its weighting mechanisms. Using BSC Designer as web-based service makes it possible to show all participants of a project the performances of business processes at a glance. I hope to convince colleagues to use BSC Designer to improve our job with it and to implement the BSC approach in our company. Dear Dr. Mattusch. We are really proud to receive feedback like this. I’d like to share with you and other potential users of our product the progress that we made in development of BSC Designer. Back in 2010 when you tried the product it was focused on KPIs and strategy maps played a minor role. As you are in software development you can confirm that to develop a good product a company needs to develop its knowledge as well. We were helping many companies with the Balanced Scorecard and it appeared that people were focusing too much on KPIs and forgetting such a powerful tool as a strategy map. Using the strategy map one can model not only KPIs, categories, their relevant weights, but an alignment between KPIs and business objectives. On the real strategy map business objectives are not just the list of potential goals, but are the developed structure of elements linked to each other by cause-and-effect connections. 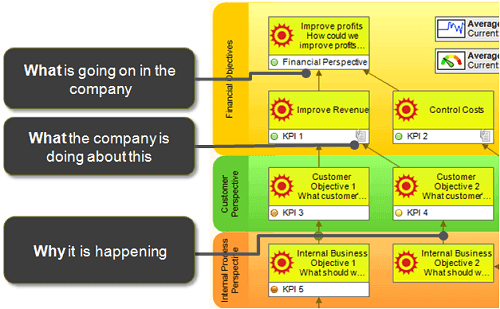 Compare the modeling with KPIs only and modelling with strategy maps. 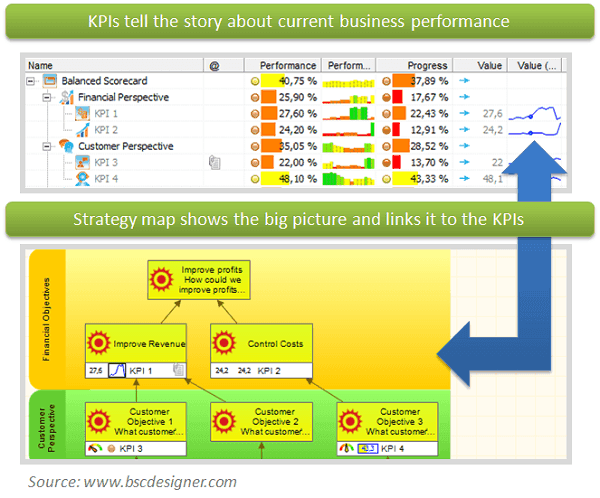 KPIs tell the story about current business performance, while a strategy map shows the big picture and links it to the KPIs. 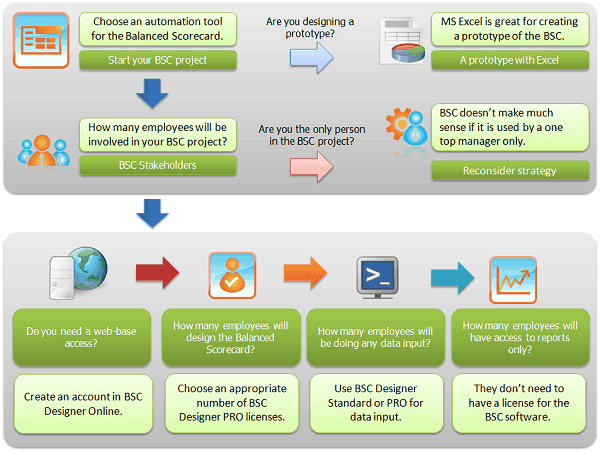 Here is how it works in BSC Designer. Sergio Valenzuela Mayer from Chile-based Consultora SVM y Cía Ltda implements BSC Designer in the business simulation class room. Students could present a whole picture of the virtual organization and share it with the professor and the other teams. Sergio was searching for packages to create dashboards of integrated KPIs, and finally decided to use the Balanced Scorecard framework because it is a good way to get a global view of an organization together with simulations, utilization of the performance indicators, and Du Pont indicators. The Balanced Scorecard project at Consultora SVM was started back in 2005. The project flow was interrupted and until now it presented just old html views with simulated data. Sergio plans to incorporate the Balanced Scorecard as an analytic tool and as a dashboard for simulated scenarios that are using simulation models of a process. The virtual organization training is intended for business owners. Sergio plans to use BSC Designer in training projects for the visual demonstrations and feedback. 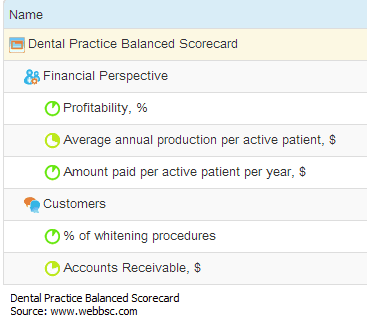 All of the participants will be using BSC Designer to create their own Balanced Scorecards. Once a team has its results they will be published online for a review. For now the Sergio worked with two perspectives – production and finance, but two more perspectives – marketing and internal performance will be included. BSC Designer will be configured to read from SQL data base the data generated by the simulator and the data entered by the workflow forms. My core business is consulting in simulation processes, mainly in mining, and a second field is the use of the models for virtual management training. For these reasons I have developed the Virtual Enterprise product. Analysis of production processes: In this module, participants can analyze production processes by simulating different scenarios and evaluate decisions made in order to improve production performance. Automating administrative processes: Participants can be organized by different teams and communicate each other’s through a workflow platform, and modifying the input data of the simulation model. Have you used Balanced Scorecard in education? What is your experience? Please, share in the comments.